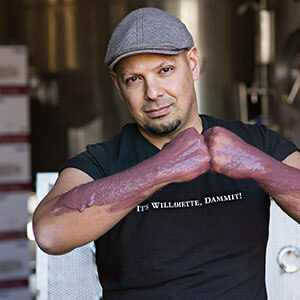 Head Winemaker Joe Ibrahim knew from a very early age that he was destined for a career in viticulture and enology. Growing up in New York, his childhood hobbies included a fascination for growing plants and experimenting in chemistry. When he was old enough, his parents gifted him with a home winemaking kit and he began making all kinds of fruit wines including dandelion wine and turnip wine. While not exactly palatable, he never tired of learning about the process of transforming juice into wine. Naturally, Joe decided to study Plant and Soil Science at the University of Vermont. After classes and in the summer he interned on a small family-owned vineyard and winery in Northern Vermont on Lake Champlain under the tutelage of a French Canadian winemaker. He learned about the basics of winemaking, cultivating grapes in a harsh Northern climate, and began to develop his palate. After graduating college, he accepted a position with Ste. Michelle Wine Estate in Washington State, where he learned about making wine in the Pacific Northwest. He was later offered a position with Gallo Family in California where he learned about brandy distillation as a Spirits Maker and sparkling wine production as the Senior Winemaker in charge of the sparkling wine program. He came to discover that his true passion is in crafting premium cool climate varieties like Pinot Noir and Chardonnay. As the Head Winemaker for Edna Valley Vineyard, in one of California’s coolest AVA’s, he crafted premium and luxury wines and developed a reputation for creating award winning wines from some of the region’s most iconic vineyard sites. Jim Bernau invited Joe to visit Willamette Valley Vineyards and he instantly knew he had found his new home. Joe proposed to his fiancé Jo in the guest suite on the Estate, the night of his interview and shortly thereafter they moved (with their two dogs) to Oregon to join the winery in the pursuit and passion to create the highest quality Pinot Noir in the valley.